[SatNews] The Spaceport is continuing its sustained mission pace in support of Arianespace’s 2015 launch schedule, with the DIRECTV-15 satellite having now arrived in French Guiana for another heavy-lift Ariane 5 missions. Top image: The DIRECTV-15 satellite is ready for unloading from the chartered Antonov An-124 cargo jetliner at Félix Eboué Airport in French Guiana. 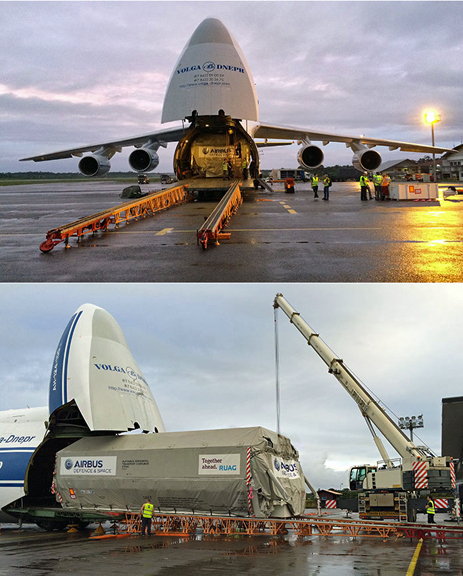 Bottom image: Built by Airbus Defence and Space, the DIRECTV-15 satellite was transported to French Guiana in a protective 14-meter-long container. DIRECTV-15 was delivered to French Guiana aboard a chartered Antonov An-124 cargo jetliner that landed at Félix Eboué Airport near the capital city of Cayenne. Protected in a 14-meter-long shipping container, the broadcast relay satellite was unloaded and transferred by road to the Spaceport, where it now is being readied for pre-launch checkout in the S5 payload preparation facility. This spacecraft will be one of two passengers for an Arianespace heavy-lift mission in May, which is designated VA223 in the company’s numbering system. The DIRECTV-15 satellite was built by Airbus Defence and Space and will have a liftoff mass of approximately 6,200 kg. As one of the most powerful broadcast satellites ever built for the United States (with an 18-kW end-of-life power), the relay platform will provide additional services for more than 20 million customers of DIRECTV – a world-leading digital television entertainment services provider.